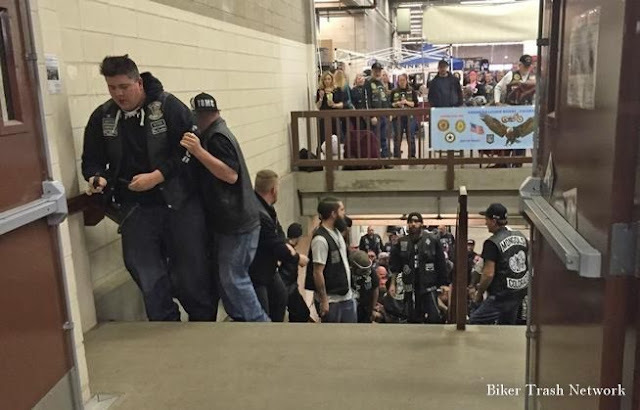 Denver, CO (December 26, 2017) BTN— Two years after a member of the Mongols MC was murdered at a swap meet, the event is being allowed to return to the National Western Stock Show complex. One person was killed and several others wounded in a confrontation between a member of the Mongols MC and the Iron Order in February 2016. 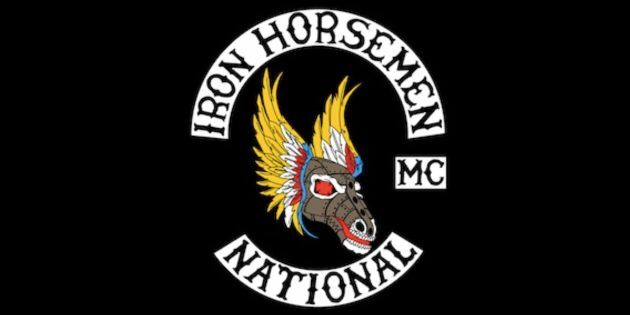 Derrick Duran of the Iron Order, was not charged after he claimed he fired in self defense at a member of the Mongols MC. “One Mongol punched me four times. I said stop it ‘Stop it leave me alone.’ Boom. I discharged a weapon,” he said in an interview with police from that day. A Mongol was carried downstairs and Duran said he went to police. “I said, ‘I shot back in self defense here’s my weapons,'” he said. The event was banned the following year. The Mongols MC and the Iron Order are banned, and no knives, guns, drugs or outside alcohol will be allowed. Confederation of Clubs’ attorney, Wade Eldridge, said their members, which include the Mongols, would not attend due to city demands. 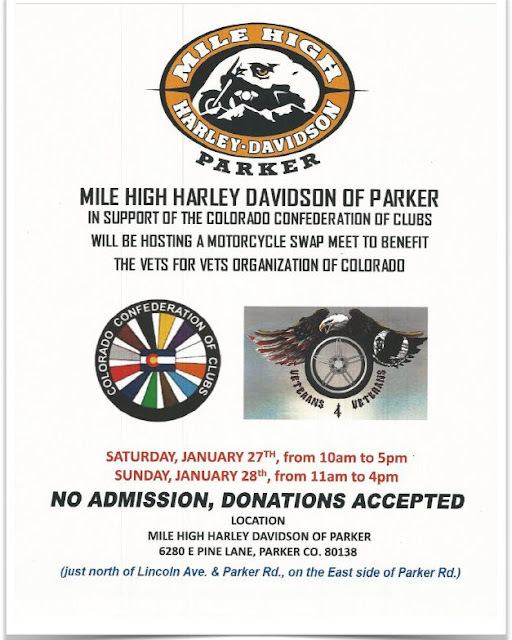 So the Confederation is offering a different event the same day at Harley Davidson in Parker to benefit veterans. At the Stock show event January 27-28th there will be metal detectors and extra security to prevent a return of violence. The Biker Trash Network posted both event links after the video below. 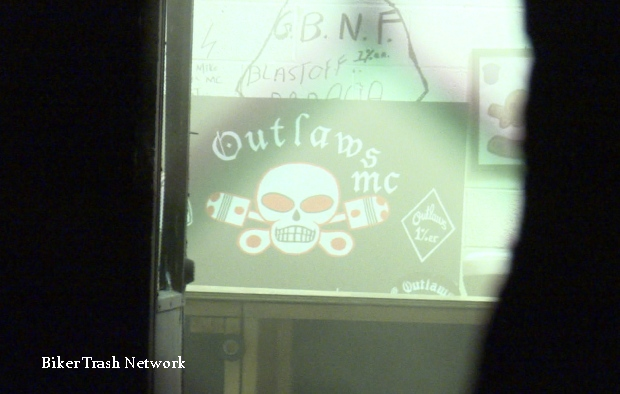 Joliet, IL (December 26, 2017) BTN— The Outlaws Motorcycle Club’s clubhouse in Joliet has been in the spotlight ever since it was searched in connection with the death of a young bartender who went missing in November. The Outlaws clubhouse in the 1900 block of East Washington Street has attracted controversy in the past two years over the display of a Confederate flag, as well as having signage deemed inappropriate by a local pastor because of how close it was to the Barr Park playground. The clubhouse attracted more controversy after Will County sheriff’s deputies searched it Nov. 16 as part of an investigation into the death of 24-year-old Kaitlyn Kearns of Mokena. One of the club’s former members and Kearns’ boyfriend, Jeremy Boshears, 32, of Coal City, was arrested for allegedly killing her. 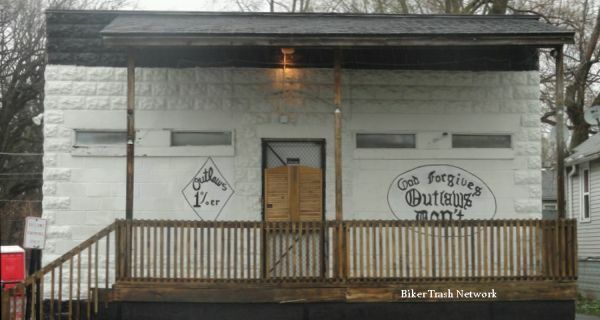 The motorcycle club’s motto “God Forgives, Outlaws Don’t” was once prominently displayed on the front entrance of the clubhouse. It has since been scrubbed, along with many other signs, except for the acronym for the American Outlaws Association.Yet still behind the clubhouse is a small stage with the Outlaws’ name and a skull symbol. “They’ve been totally cooperative throughout this investigation,” Jungles said. No one answered the door to the Outlaws’ clubhouse Friday. Emails sent to the Outlaws Motorcycle Club were not returned. Despite the controversy, Wade Lake, 53, one of the owners of Saloon 2, 1827 E. Washington St., said he believes the Outlaws get a bad rap and he’s never had a problem with their members. Will County Deputy Chief Dan Jungles said the Outlaws members have been open to speaking with deputies. Leona Tichenor, a pastor at Ingalls Park United Methodist Church, has been critical of the clubhouse over its motorcycle club symbols and motto being displayed near the Barr Park playground. “That’s a very adult-use (display) next to a children’s playground,” Tichenor said. In an email, she said she appreciated that the Outlaws have “toned down the exterior signage and are only flying the Stars and Stripes,” referring the U.S. flag that now waves outside the entrance. Jungles said the county sheriff’s office has not had any calls to the clubhouse itself. Deputies have also not received any blowback when speaking with Outlaws members for the investigation concerning Kearns’ death, he said. Based on what’s been indicated to deputies, Boshears, who faces a first-degree murder charge, belonged to the Outlaws but his membership was revoked after Kearns had gone missing, Jungles said. He said he assumed it might have something to do with the criminal case. “They have their own reasons for doing what they do. That’s not something I can really comment on,” Jungles said. Kearns worked at Woody’s bar, 1008 E. Washington St., roughly a mile from the clubhouse, and was with Boshears on the night and early morning she was last seen before she went missing on Nov. 13, police said. Kearns was later found dead from a gunshot wound to the head on Nov. 16 in her 1996 Jeep Grand Cherokee in a pole barn in Aroma Park Township in a rural area of Kankakee County. Jungles has said someone he refused to identify drove Boshears from Aroma Park Township after Kearns’ death. He declined to specify where Kearns’ death occurred. Will County State’s Attorney Spokesman Charles B. Pelkie declined to comment on the case as it is under prosecution. Boshears’ attorney Neil Patel has declined to comment on whether Boshears’ is an Outlaw member and where Kearns’ death occurred, citing attorney-client privilege. Boshears has pleaded not guilty to first-degree murder. His bond was set at $10 million and he remains in custody at the Will County jail. Buffalo, NY (December 23, 2017) BTN — For more than six decades, the gold knight's helmet with the red plume on top – a frequent sight on local streets and highways – served as a reminder of the Kingsmen Motorcycle Club's dominating presence here. No other biker club enjoyed deeper roots in the community. But earlier this month, a yearlong legal fight over the Kingsmen name and organization resulted in a court-approved agreement requiring the club's two factions to form new clubs under new names. In short, the Kingsmen, at least in the eyes of New York State, are no more. Not surprisingly, in an organization whose motto is "Live Kingsmen, Die Kingsmen," both sides are disappointed in the outcome. "That is as important, if not more important than, the ownership of any property," said Charles J. Marchese, a lawyer for the previous leadership, of the Kingsmen name and history. The agreement, drafted by State Supreme Court Justice Henry J. Nowak, grew out of a dispute between the club's two factions, a dispute first aired in a federal indictment accusing the Kingsmen of operating a criminal organization that relied on drug dealing, gun sales and prostitution to make money. The indictment also charges David Pirk, then national president of the club, with orchestrating the murder of two Kingsmen in North Tonawanda and suggests the killings were a message to club members opposed to Pirk and the transition to a criminal enterprise. The agreement, known as a stipulation, is part of a larger resolution still being finalized. As part of the agreement, the court gave each side in the dispute ownership of one of the Kingsmen's four local clubhouses — one in Lockport, the other in Niagara Falls — and ordered the other two put up for auction next month. The clubhouses being sold are at 846 E. Eagle St. in Buffalo and 332 Oliver St. in North Tonawanda, the site of the double murder. "After several months of litigation, my clients and Mr. Marchese's clients thought it best to agree to the stipulation in order to bring closure," said Joseph G. Makowski, a lawyer for the new leadership group. Makowski said the auction is expected to take place in late January. 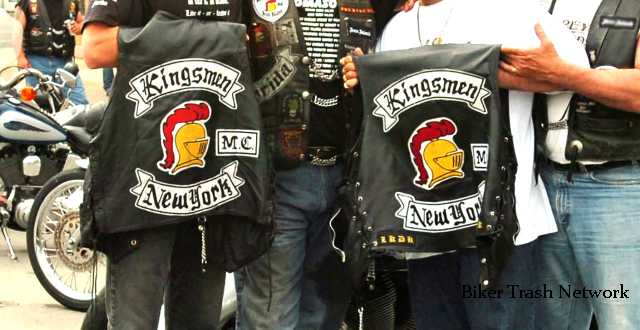 The settlement does not affect club chapters in other states but, here, it means the Kingsmen name, a fixture in the biker community since the 1950s, cannot be used in forming a new club. Under the agreement, the Kingsmen will continue to exist on paper as an organization but without any legally recognized leadership. Filed in February, the civil suit was an effort by the club's new leadership to assert control over the organization in the wake of Pirk's arrest and detention. The suit, filed by a member who asserts to be the national secretary and others, points to a nationwide election in 2013 that put Pirk in charge as evidence of their legitimate claim to the club's leadership. The other faction, led by John Spry, one of the founding members of the Kingsmen, opposed the takeover and challenged the legitimacy of Pirk's election. Unlike most biker feuds, this one ended in four-day trial before Nowak, who was faced with deciding if any of the Kingsmen's national elections followed the law and club's bylaws, and if the people elected during those elections are now the club's legitimate leaders. "Resolving the issue of which election, if any, complied with the law, was difficult, if not impossible for the court to determine," Marchese acknowledged. In the end, the four clubhouses, most of them with deep roots in their neighborhoods, became the core of the suit. Nowak's stipulation gives each side one clubhouse and orders the other two put up for sale. An auction date will be announced soon. "There's still a fair amount of work to be done," Makowski said Saturday. Under the agreement, the clubhouse on North Transit Road in Lockport will go to the group led by Spry and the clubhouse on Cudaback Avenue in Niagara Falls will go the group led by Richard Rook, national secretary for the club. The agreement also requires the two sides to form new clubs without using the Kingsmen name. Use of the Kingsmen patch — the well-known knight's helmet — is not affected by the stipulation. Marchese said Spry and the others have already chosen a new name: Knights of Armor. He doesn't know if the other side has chosen a name. The agreement is the latest chapter in a year-old civil suit over the use of the Kingsmen name in New York State. Marchese said the club was started by Spry and others in the 1950s and was incorporated in 1988 as a nonprofit organization. Federal prosecutors say a feud within the club erupted when Pirk took over as president and led an effort to convert the Kingsmen to a "one percent" club, biker slang for gangs that engage in criminal activity. "They prided themselves on not being a one percent club," Marchese said of his clients, the leadership replaced by Pirk and others. 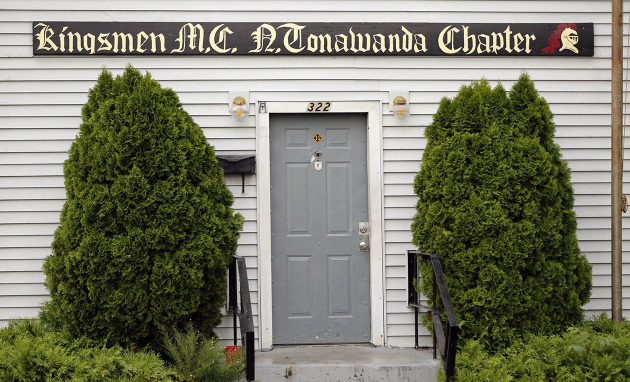 The feud, which pitted members in New York against members in Florida and Tennessee, led to the murders of Daniel "DJ" Szymanski and Paul Maue outside the North Tonawanda clubhouse, prosecutors allege. Kingsmen Andre Jenkins, the man who killed Maue and Szymanski, was convicted in state court and is serving life without parole. Pirk, who is charged with orchestrating the murders, will go on trial next month with Jenkins and five others in the federal case. Odessa, FL (December 22, 2017) — Three motorcycle club members have been arrested in connection to a homicide that occurred near Suncoast Parkway and State Road 54 in Pasco County on Thursday evening. At 4:53 on Thursday afternoon near the northbound exit of the Suncoast Expressway on State Road 54, the victim was driving a pickup truck when two suspects on a motorcycle pulled up and got off the motorcycle. One suspect tapped on the window of the pickup truck to get the attention of the victim. The suspect fired several shots and killed the victim in his truck. The victim has been identified as Paul Anderson, 44, President of the Cross Bayou Chapter of the Outlaws Motorcycle Club in Pasco County, Florida. Witnesses in the area submitted tips about the shooting and helped lead officials to three arrests. The motorcycle club behind the shooting has been identified as the "69 Motorcycle Club" aka the "69ers." Officials arrested the second biker, Michael Mencher, known to the motorcycle club as "Pumpkin." Mencher was wearing a Nazi helmet at the time of the shooting. Mencher was arrested with the help of Tampa police. Allan Guinto, known to the motorcycle club as "Big Bee" was arrested in Pinellas County. Sheriff Nocco says Guinto was the driver of the "scout car." Sheriff Nocco says Christopher Brian Cosimano "Durty" was identified as the shooter by ATF officers, and he is the president of the "69ers." All three suspects will be charged with first degree pre-meditated murder. "We suspect that there will be more violence in the Tampa Bay Area because of this incident" Sheriff Nocco said at the news conference on Friday. On Thursday night, Sheriff Nocco held a news conference to release details about the shooting, in hopes making an arrest in the case. "This shooting, thank God an innocent person was not killed," said Sheriff Nocco. A witness heard three loud "pops" and saw the driver of a truck slumped over. Investigators have not released the identity of that driver but tell us he was a documented motorcycle gang member. 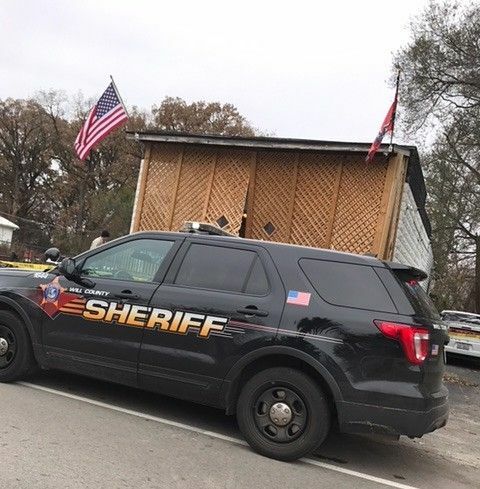 "We're concerned about that one bullet that doesn't hit its target and hits the wrong person, hits an innocent person that's just trying to live their lives," said Sheriff Nocco. Some portions of both roads remained shut down hours after the deadly shooting. Many drivers were forced to take alternative routes or wait in an area that already experiences heavy rush-hour traffic. "We were about 20 minutes late, there's just an incredible amount of traffic on the highway here and we're just stuck at light after light," said Matt Devine, who was stuck on S.R. 54 trying to get to a family dinner. 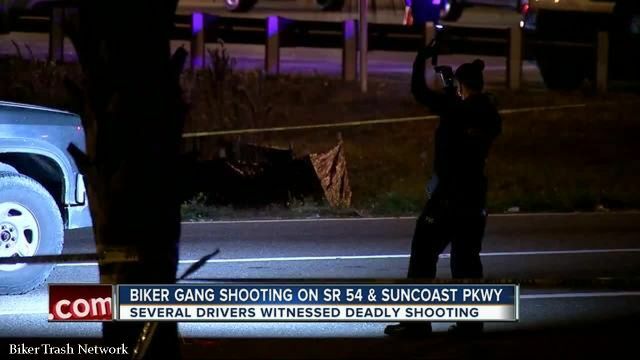 Odessa, FL (December 22, 2017) — Pasco County deputies are investigating a shooting death near the intersection of the Suncoast Parkway and State Road 54. Sheriff Chris Nocco said the shooting is related to motorcycle club activity and releases photos of the suspects. "This shooting, thank God an innocent person was not killed," said Sheriff Nocco. PCSO is now asking anyone with information to come forward about the two people who fired the shots, seen riding motorcycles with the tags covered up. Sheriff Nocco says it appears this was an internal issue and the victim was targeted. However, he warned about the impact escalating biker gang violence has on the community. Utrecht , Netherlands (December 20, 2017) — Dutch judges have now banned the Bandidos Motorcycle Club throughout the Netherlands and ordered all of its chapters to close down immediately, saying it posed a public threat. The case had been brought by the Dutch prosecution service, which alleged the bikers were involved in drugs and arms trafficking as well as prostitution. 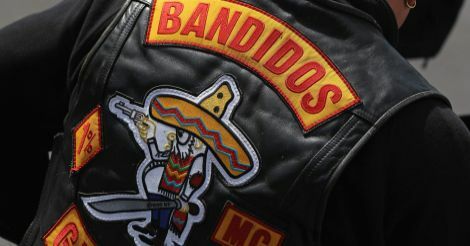 “The Bandidos characterize themselves as lawless and use slogans that contain violent messages,” the court in the Dutch city of Utrecht said in its ruling. “The club has a culture in which carrying out serious violence is encouraged,” it added, highlighting how patches crowing “Expect No Mercy” were handed out to members after bloody fights. The lawyer for the Bandidos, Marnix van der Werf, told the NOS public broadcaster they would appeal. The club has argued that they should not be banned for the acts committed by individuals. But the Minister for Legal Protection Sander Dekker welcomed the ruling, saying in a tweet that “such clubs undermine our legal system”. He added that the government would press ahead with its pledge to outlaw all motorcycle gangs. Founded in the United States in 1966, the Bandidos Motorcycle Club opened its first chapter in The Netherlands three years ago in the small southern city of Sittard. Other Bandidos chapters then opened in the cities of Alkmaar, Utrecht and Nijmegen. But the Bandidos presence raised the hackles of its bitter rivals the Hells Angels, and the southern Limburg province has witnessed a rise in violent crimes, including Molotov cocktails being thrown at members’ homes and ugly public brawls. 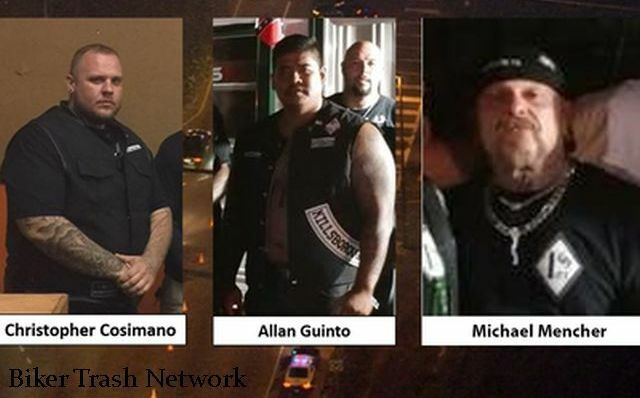 Other countries such as Germany have already moved against the Bandidos, while in the United States motorcycle club leaders have been arrested and charged. The Bandidos penetrated into Scandinavia in the 1990s, triggering a bloody war with the Hells Angels which lasted a decade. 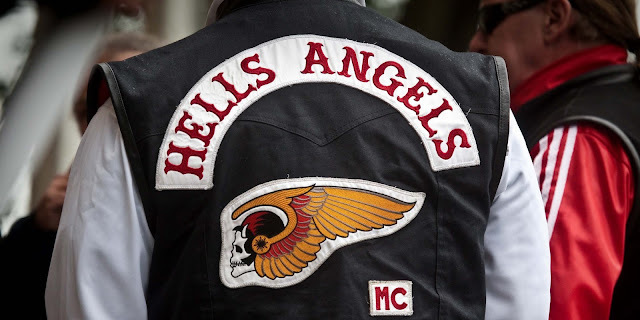 Dutch justices have also tried in vain several times to outlaw the Hells Angels as a criminal organization. The court said there were more than 200 Bandidos chapters around the world with some 2,500 members. 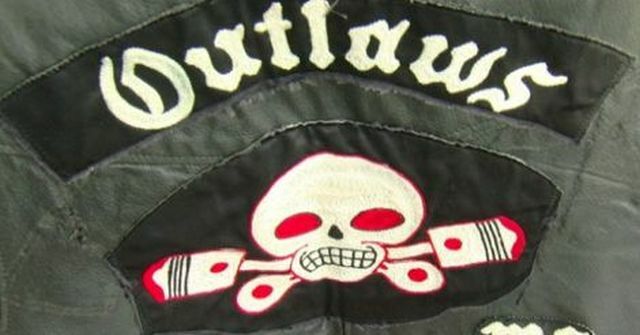 The Netherlands is also moving to ban what it considers homegrown outlaw motorcycle clubs including Satudarah and No Surrender which was established in 2013 and has seen rapid growth in recent years. Toronto, Ontario (December 20, 2017) BTN— Toronto firefighters discovered a small, licensed cannabis grow operation while battling a three-alarm blaze in a building complex shared by the Outlaws motorcycle club overnight Wednesday. 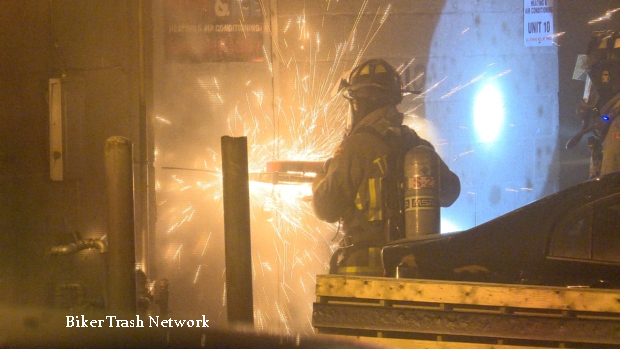 Crews responded to the fire at 40 Barbados Blvd., near Eglinton Avenue E. and McCowan Road, at 1:37 a.m. and discovered the location is home to a heating and air conditioning company. 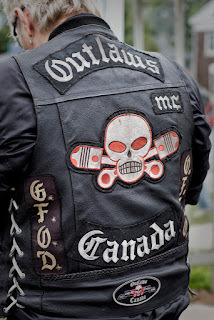 Firefighters had to "forcibly gain access" to the interior of the building which also houses the clubhouse of the Toronto East chapter of the Outlaws, a Chicago-based motorcycle club with chapters throughout the world. The complex was empty when firefighters arrived. Biker Trash Network. It soon became clear that the fire was also burning in the building's roof, which required crews to cut a hole in it and use an aerial ladder to douse flames from above. In all, about 20 trucks responded to the scene. The blaze was under control by 3:20 a.m., according to Toronto fire Capt. David Eckerman. Firefighters eventually discovered what police said is a licensed, legal cannabis growing operation in the building. Eckerman said it was determined that the grow-op was unrelated to the fire. Investigators were at the scene this morning, probing how the blaze may have originated. The FTW does not stand for "Forever Two Wheels"
Covington, KY (December 14, 2017) — Part of Northern Kentucky's crystal methamphetamine supply rode in with the Iron Horsemen motorcycle club for two years. 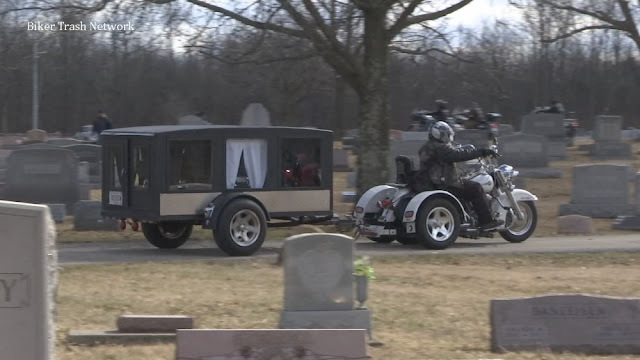 Earlier today, a federal judge sentenced an Iron Horsemen motorcycle club leader from Boone County to 35 years in prison. 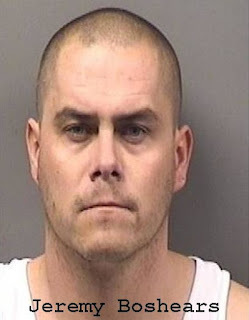 Florence Iron Horsemen chapter president and national "enforcer" Matthew Wesley Shaffer was convicted by a jury on drug distribution and weapons charges, according to a U.S. Department of Justice news release. U.S. District Court Judge David Bunning gave the sentence to the 39-year-old Walton resident Thursday in a Covington courtroom. Shaffer has to serve at least 85 percent of his sentence under federal law. Trial evidence showed Shaffer led a group of people who smuggled crystal methamphetamine in October 2016 into the Boone County Detention Center. Shaffer directed a group transporting "large" amounts of crystal meth in 2015 and 2016 from California to Northern Kentucky, according to trial evidence. On Aug. 25, 2016, police found Shaffer at his Walton home in possession of 180 grams of crystal meth, two loaded firearms, body armor and nearly $9,000 in cash. 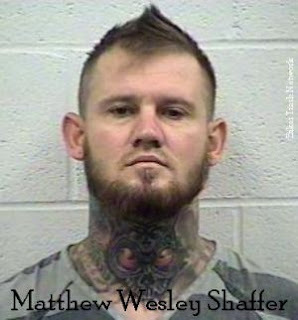 The DEA, ATF and Northern Kentucky Drug Strike Force ran the investigation of Shaffer. Biker Trash Network. “This investigation and prosecution highlights the importance of a strong partnership between local, state, and federal law enforcement in reducing violent crime and drug trafficking activities,” said Robert M. Duncan, Jr., U.S. Attorney for the Eastern District of Kentucky. New South Wales, Australia (December 10, 2017) — RIVAL bikie clubs engaged in bloody warfare for decades are burying the hatchet and merging into super clubs to chase millions in criminal profits. Police have seen an outbreak of co-operation as notorious bikie clubs headhunt the best money launderers and drug dealers from rival firms or share their skills and expertise. In a recent report, the powerful NSW Crime Commission said the highly organised gangs are difficult to police because “much of the organisation is co-ordinated offshore”. Police have seen an outbreak of co-operation as notorious bikie clubs headhunt the best money launderers and drug dealers from rival firms. The report found one-time fierce rivals such as the Hells Angels and Comanchero — the two clubs involved in an infamous fatal brawl at Sydney airport in 2009 — had decided it was more lucrative to be in bed together on “significant criminal enterprises”, including international drug shipments. 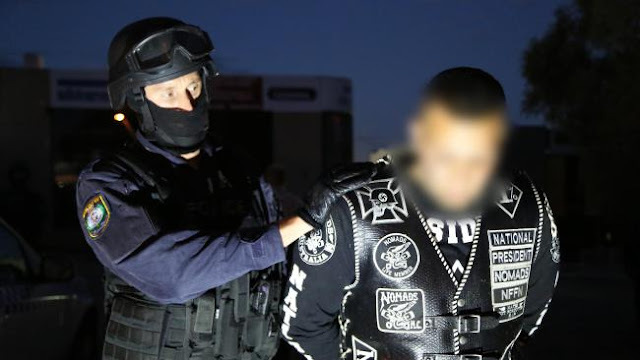 “Co-operation among organised crime groups is flourishing with traditional animosities between such members or associates as the Hells Angels Motorcycle Club, the Comanchero Motorcycle Club and the Lone Wolf Motorcycle Club diminishing,” the Crime Commission said. Bikie clubs are joining forces to gain access to millions in criminal profits. The NSW Police State Crime Command’s Criminal Groups Squad director Deborah Wallace said bikies remained enemies at low levels while their bosses did business together. “At the upper level they are quite prepared to work together to progress their criminal activity and they’ll seek out facilitators — that could be accountants, anything at all,” Detective Superintendent Wallace said. 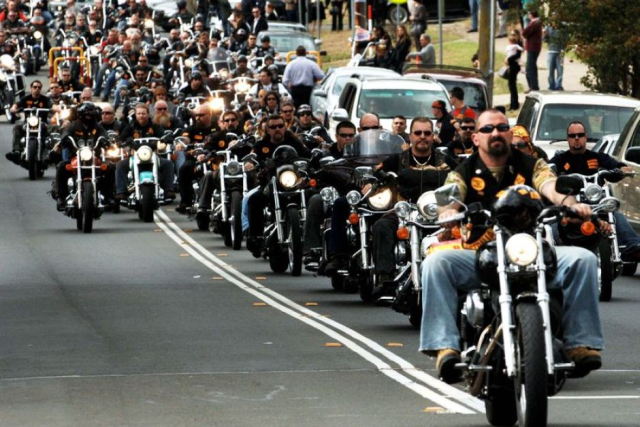 Police have cracked down on bikie gangs across Australia. A recent police restructure merged the Middle Eastern Organised Crime and the Gangs squads into the one Criminal Groups Squad, reflecting the merging of bikies with other organised criminals. 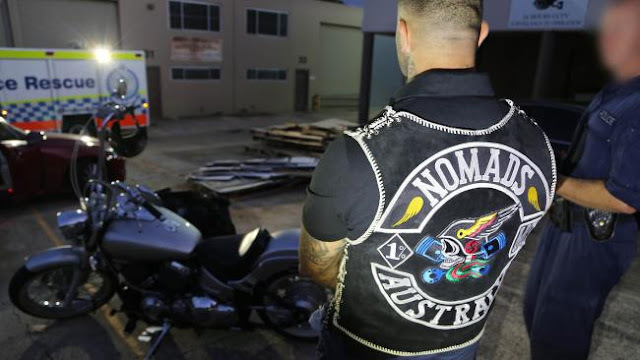 Australian Federal Police have discovered the same trend, arresting 12 men in May who they claim were running drug distribution for the Hells Angels, Gypsy Jokers, Descendants and Bandidos in South ­Australia. The Australian Criminal Intelligence Commission also found rival gangs sharing drug distributors. “Many groups that previously operated in isolation now work collaboratively to access broader distribution networks and ultimately maximise profits,” its ­August organised crime report said. 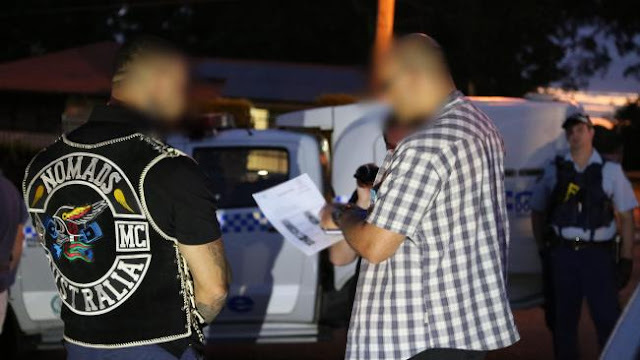 Police have merged the Middle Eastern Organised Crime and the Gangs squads into the one Criminal Groups Squad as bikies join other organised criminals. But Western Sydney University organised crime lecturer and former detective Dr Michael Kennedy said police should be under no illusion that the bloodshed between bikie clubs was over. A fatal 2009 brawl in Sydney Airport between the Hells Angels and Comancheros was a turning point in the fight against out-of-control bikies, prompting immediate action from state and federal politicians. Police have swooped on several bikie gangs this year. Hells Angel Anthony Zervas was bludgeoned to death in front of stunned travellers and one-time Comanchero boss Mahmoud “Mick” Hawi was convicted of his murder. There has not been an all-out bikie war since 2012, after forces such as the bikie-busting Strike Force Raptor smothered the club culture of guns, bikes, tattoos and grimy headquarters. Raptor has closed more than 60 clubhouses, confiscated more than 1300 firearms and put more than 3700 bikies before the courts. But bikies are determined to survive as they pursue profits in Sydney’s booming drug market, where there are astronomical mark-ups for drugs like cocaine, particularly in the affluent eastern suburbs. Quarterly crime figures released yesterday showed cocaine use and possession up an average 160 per cent in each of the last two years in the Waverley LGA. Joliet, IL (December 9, 2017) — Hours before Kaitlyn Kearns was killed, the 24-year-old bartender was serving drinks to customers, including her boyfriend, on a Sunday night last month at Woody’s Bar in Joliet when her boss called and told her it was time to close up shop, authorities said. Video from the bar shows that when the call came in, Kearns’ boyfriend, Jeremy Boshears, argued with Kearns in person and her boss over the phone. After arguing, he slammed the phone down and left, Will County Deputy Chief Dan Jungles said. A short time later, Kearns would be shot once in the head. Investigators say Boshears killed her and tried to cover it up by hiding her body and her car. Boshears, who authorities have said is a member of the Outlaws Motorcycle Club in Joliet, was indicted Wednesday on three counts of murder and one count of concealing a homicide. The 32-year-old Coal City man appeared in court Friday with his attorney, Neal Patel, and pleaded not guilty. He is being held in the Will County Adult Detention Facility on $10 million bail. Jungles said Kearns, of New Lenox Township, and other bar patrons were hanging out having drinks on Nov. 13 when her boss checked out video surveillance images and saw people still in the bar after closing time. Her boss, who was able to monitor the cameras off-site, called to tell Kearns the bar should be closed and that everyone had to leave. Video shows a “clearly enraged” Boshears grabbed the phone from Kearns and began arguing with Kearns and her boss before slamming down the phone and leaving, Jungles said. Boshears then drove himself to the Outlaws Motorcycle Club less than 2 miles down the road from the bar. Other bar patrons followed suit and video shows Kearns showed up at the club after she closed up the bar. Surveillance video shows Kearns leaving the bar by herself around 12:40 a.m. and arriving at the Outlaws club, Jungles said. Though there is no video of her leaving the club, there is video showing her car leaving the club’s parking lot around 4 a.m., Jungles said. He would not comment on what happened after Kearns’ showed up at the club. Kearns’ family reported her missing on Nov. 14. Authorities used “electronic means” to locate Kearns’ 1996 Jeep Grand Cherokee in a pole barn on private property in Kankakee Township. Kearns’ body was inside the vehicle. Investigators do not believe other members of the Outlaws Motorcycle Club played a role in Kearns’ death, Jungles said. And though authorities initially rammed down the front door of the clubhouse entrance to execute a search warrant, Jungles said club members have been cooperative with investigators. Patel on Friday told Will County Judge Carla Alessio Policandriotes he plans to issue subpoenas for evidence in the case. Boshears is scheduled to appear in court again Dec. 28. Kearns' relatives and friends attended Friday's hearing but declined comment. Boshears has pleaded not guilty to first-degree murder Nov. 20. Canterbury, New Zealand (December 8, 2017) — The Tribesmen Motorcycle Club have made their way to Canterbury. But police are already on their tail, raiding club-connected properties across the region last week. 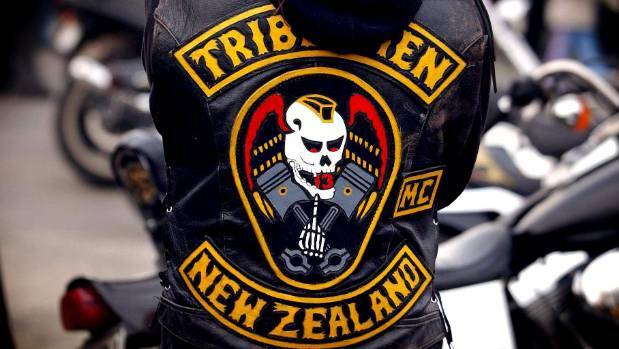 The Tribesmen have chapters set up in Otara, Rotorua, Murupara in the Bay of Plenty, and in North Canterbury, where police say the motorcycle club has been setting up a “new pad”. The spread of the Tribesmen into Canterbury adds to a number of heavy-hitting motorcycle clubs including the Bandidos, Head Hunters and Rebels, as well as other clubs such as the Mongrel Mob, Black Power, King Cobra and the Neighbourhood Crips. MIGRATION: The Tribesmen Motorcycle Club originates from Otara, South Aukland and have set up chapters in Rotorua, Murupara, Bay of Plenty, and now in North Canterbury. On Tuesday last week, scores of armed police descended on properties believed to be linked to the Tribesmen MC on Jacksons Rd, Ohoka; Lower Sefton Rd, Sefton; Barbadoes and Cranford Sts; as well as a number of storage units where methamphetamine, firearms and cash were found. Witnesses described helicopters with a large number of armed officers landing in Swannanoa, North Canterbury. The Tribesmen have links to the Killer Beez, an Otara street gang run by former Tribesmen president, Josh Masters, who is serving 10-years in prison for drug dealing and money laundering. In the past, the Tribesmen have had links to the New Zealand Nomads, Black Power and Bad Troublesome Ward. The Tribesmen are known for violent feuds with the Mongrel Mob. In 2010, 16-year-old Jordan Herewini was murdered by mob member Quentin Pukeroa for wearing yellow – which made him appear to be an associate of the Tribesmen – as a result of tension in Murupara between the two gangs. He was wearing his yellow school PE shirt. The teenager was run down by Pukeroa after being struck to the ground with an axe in the middle of Murupara. Pukeroa was sentenced to 15 years in jail. So what brings the Tribesmen to Canterbury? Police say there is a small core group of about eight to 12 Tribesmen MC members in Canterbury but a definitive number couldn’t be supplied because of prospects and affiliates in and out of prison. Canterbury University sociologist and gang expert, Jarrod Gilbert, said the most likely reason the Tribesmen have come to the mainland is simply migration. Associates or members have moved into the area and continued doing what they were doing back home. “In the past, this would have been cause for war, but the whole scene is expanding. People move around and keep their affiliations alive,” he said. Due to many club members getting older, he said the violence was decreasing. “A lot of the older clubs have fallen away and left a gap and others have moved in,” he said. However, he said “in a crowded room eventually some gets elbowed”. “A lot of the older guys are handbrakes for the younger guys. Not like back when they were starting up and there was no real adult supervision. Now there are some older guys around keeping a lid on things,” he said. Canterbury field crime manager, Detective Inspector Greg Murton, said family connections and work opportunities are reasons why they could have moved into the area. “While they remain in Canterbury and deal methamphetamine, they will receive close attention from police on an ongoing basis,” he said. Three were arrested in the recent raids in and around the city, which Detective Inspector Murton described as an extensive two-month investigation into a number of members and associates of the Tribesmen MC. More than $200,000 in cash, 100g of methamphetamine and a number of sawn-off shotguns and rifles were seized in the raids. Police also found a large amount of property including motorcycles which have been retained by the asset forfeiture unit. As a result of the raids, three people were arrested. Andrew Michael Smith, 32, has pleaded not guilty to supplying methamphetamine, two charges of possession of the drug for supply, failing to assist an officer carrying out a search, and driving while suspended. Smith’s 50-year-old mother, Connie Elizabeth Ross, pleaded not guilty to being a party to possession of methamphetamine for supply, being a party to the supply of methamphetamine and unlawful possession of a sawn-off shotgun. Lincoln plasterer Mitchell John Sullivan, 18, has been charged with possession of methamphetamine for supply, possession of cannabis, possession of a utensil for using the class A drug and failing to assist a police officer carrying out a search. Six other Tribesmen MC members and associates have also been arrested over the past few months. They face a variety of charges relating to firearms, drugs, kidnapping, aggravated robbery and receiving stolen property, Detective Inspector Murton said. “These search warrants and arrests are the culmination of several months’ work targeting suppliers of methamphetamine, to reduce the harm it causes within our community,” he said. On November 1, police and customs officers intercepted $50 million of methamphetamine in an airfreight consignment sent from Mexico. It was the largest methamphetamine bust in the South Island. Jonathan Seal, 25, and Michael Harrison-Cooper, 31, were charged with importing a Class A drug and possession of methamphetamine for supply. Detective Inspector Murton said there was no link that he was aware of between the Tribesmen MC and the Mexican meth import. London, Canada (December 6, 2017) — The Outlaws MC in London hasn’t disappeared, it just moved to another location. And it’s now supported by a new puppet club called the "Filthy 15", police confirm. 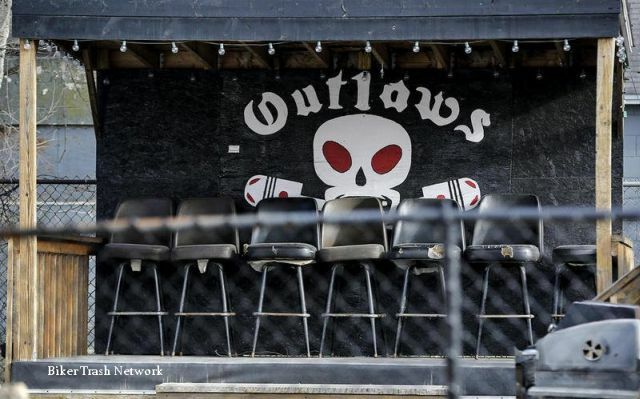 With the recent arrests of four members and the closing of a clubhouse only months after opening, it appeared the Outlaws’ resurgence — in a city supposedly dominated by the Hells Angels —was short-lived. But what sources say is a new and bigger clubhouse has opened up, with about 15 full patch members, and half as many Filthy 15 puppet club members. Meanwhile, what may be early tensions between the Outlaws MC and Hells Angels MC have spilled into the Elgin-Middlesex Detention Centre, the provincial jail in London, sources say. Outlaws leader Ryan Mark Daigneault, 41, was charged with counselling to commit murder in October and was being held at EMDC. One source at EMDC says there’s a price on Daigneault’s head, and there was an attempted assault on him in the jail. “In regards to an occurrence at the EMDC, we have been made aware of an alleged incident; however, there was no request or complaint, as is required, to initiate an investigation,” London police Const. Sandasha Bough said. “While we are aware the Outlaws are still in London, we will not comment on the location of any possible clubhouses. We are also aware of the Outlaws puppet club called the Filthy 15,” Bough said. Police wouldn’t comment on its estimates of the membership numbers of either club. The building identified by sources as the new clubhouse is located on Brydges Street, not far from where a clubhouse opened last spring. The previous clubhouse boasted an AOA (American Outlaws Association) sign, and motorcycles with the Outlaws skull and pistons logo were parked outside. What might be a new clubhouse has no signs, but does have four high-resolution security cameras covering several steel doors. The only glass door is covered so nothing is visible from the outside. An employee at a business next door said he had no idea what went on behind the walls of his neighbor and didn’t care to. The owner of the building says she was told some kind of repair work was being done out of that space, but was checking further. An Outlaws supporter said the club has deep roots in London and the new clubhouse — wherever it is — will be well fortified. “And the Hells Angels do have something to be worried about in London because the Outlaws MC are not going away,” he said. London police haven’t said who the target was in the charges against Daigneault of counselling to commit murder. Also arrested in the alleged murder plot was a 30-year-old London man, charged with possession of a restricted firearm and another weapons offence. 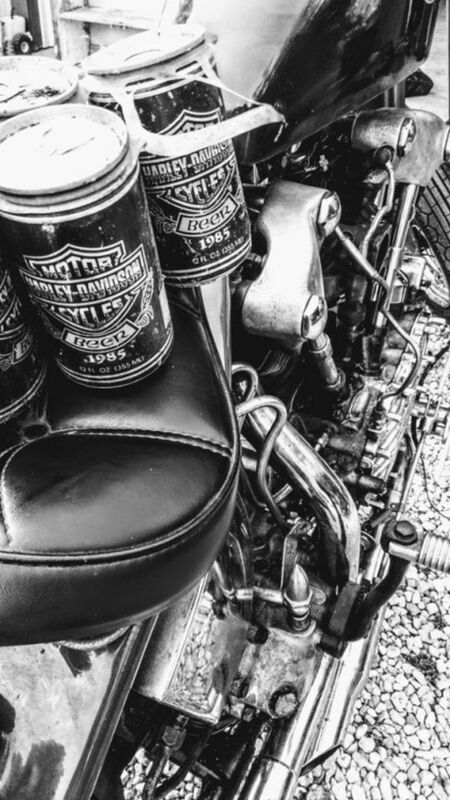 Earlier in October, the OPP’s biker enforcement unit laid 18 drug and weapons charges against two members of the Outlaws MC's London chapter, resulting from an investigation into cocaine trafficking in the London area. Opening a London chapter in 1977, the Outlaws dominated the city’s criminal biker scene for decades until the Hells Angels MC opened a prospect chapter in 2001. Several prominent Outlaws — including the chapter president — patched over to their bitter rivals. Then a province wide police bust in 2002, called Project Retire, put dozens of Ontario Outlaws MC members behind bars, though relatively few ended up serving much time. 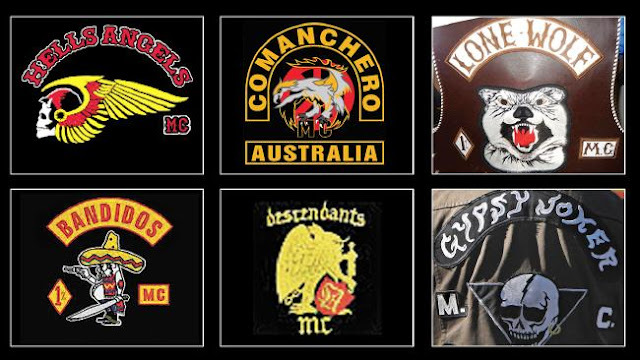 Some remaining Outlaws MC members tried to start a Bandidos MC chapter, which was destroyed by the massacre of eight Bandidos in 2006 and prison terms for six others. The clubhouse on Egerton Street was demolished in 2009. 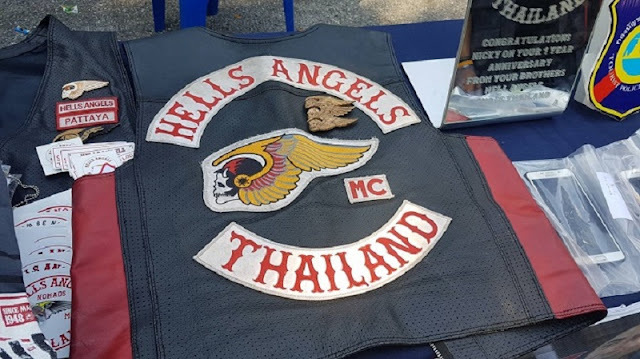 Pattaya, Thailand (December 7, 2017) — A huge police operation swooped on five locations in the Pattaya area and arrested eight Hells Angels members. They all face at least expulsion from Thailand and possibly a lot more after police claimed they were a threat to Thai society and discovered a cache of guns, knives and ammunition. Two cars were also seized in the raids at housing estates across Bang Lamung and Nong Prue. 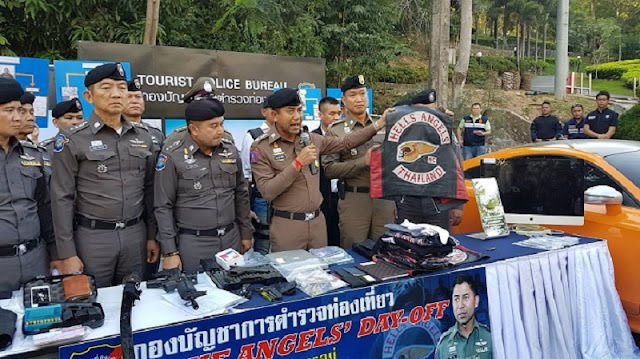 The operation was mounted by the tourist police headed by chief Surachet Hakpan who has been tasked by the Thai government to clear up the foreign trash masquerading as tourists. Surachet's men were assisted by 191 special branch, drugs suppression officers and cops from the Pattaya and Nong Prue stations who all appeared at tourist police HQ yesterday to announce the news. Three of the men arrested were Australians and one Canadian. The nationalities of the other four were not reported yet. Police recovered 9mm guns, BB guns, a host of knives and ammunition. An Audi sports car and a Ford G-T were also seized - the cars and all the individuals will be DNA tested to prove their link to crime. Police say the arrests are over money laundering, extortion and human trafficking. Penalties if those offences are proven could be severe. But so far the eight individuals have had their permission to be in Thailand revoked with their visas removed. The operation was given the title in Thai of "Clipping the Wings of the Angels". Albury, Australia (December 6, 2017) — TWO members of the Bandidos MC have been charged with drug supply offences in Albury as part of Strike Force Stoutland. Police from the southern NSW city will allege the strike force unveiled a significant drug network run by Motorcycle clubs. Local police today arrested a 34-year-old Bandidos member and charged him with a range of drug-related offences including five counts of supplying a prohibited drug, two counts of offering to supply a prohibited drug, two counts of fraud and participating in a criminal group. Detectives also arrested a 66-year-old man, who is now facing charges of participating in a criminal group and multiple drug-supply charges. A 26-year-old woman was also arrested and charged with offences relating to drug supply, proceeds of crime, using false documents and participating in a criminal group. Across the Victorian border, a 26-year-old member of the Bandidos was also arrested. He was extradited to Albury, where he faces a raft of charges including dishonestly obtain financial advantage, using false documents and participating in a criminal group. The four faced court today, with police expecting to make further arrests. Rockford, Illinois (December 5, 2017) — Three members of the Hells Angels MC are found not guilty of battery and robbery charges. Christopher Lawson, John Savalick and Richard Todd were in court Monday morning for their bench trial for the beating and stabbing of then-president Josh Johnson. "The defendants and attorneys are very grateful to Judge McGraw for being such a thoughtful jurist that he paid close attention to all the evidence, that he considered all of the evidence," says Attorney for John Savalik and Richard Todd John Palmer. All three men were found not guilty of four counts of aggravated battery and four counts of armed robbery. "Josh Johnson clearly was the aggressor in this situation," says Attorney for Christopher Lawson David J. Brown. 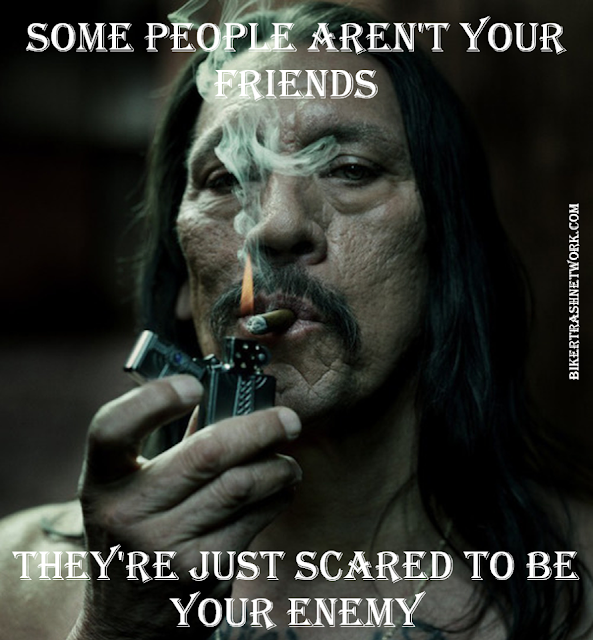 "Legally, if someone is attacking you, you have rights to defend yourself. And that's exactly what happened in 2013 with these guys. They defended themselves against a much, much larger, violent person says Palmer. Investigators say Johnson was stabbed and beaten at the Hells Angels clubhouse at 1109 Rock Street back in June of 2013. 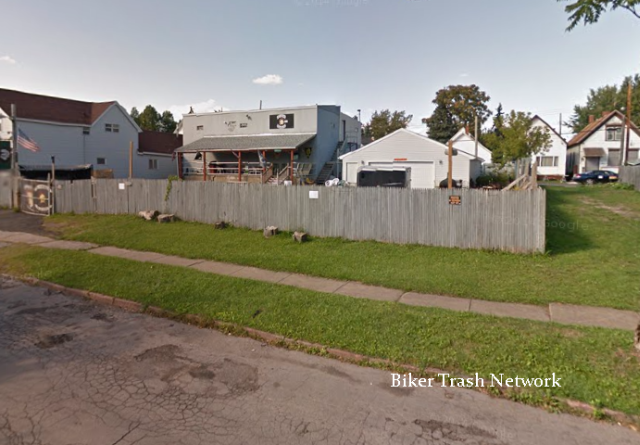 Buffalo, NY (December 2, 2017) — Andre Jenkins was eager to distance himself from his murder of two fellow Kingsmen MC members in North Tonawanda, NY on a late summer day in 2014, when he hopped on his motorcycle and returned to the clubhouse in Tennessee, according to prosecutors. But what greeted Jenkins was far from a welcome home party. Inside, the Kingsmen also known as Little Bear discovered a scene right out of "Sons of Anarchy": a room covered in plastic and several Kingsmen Motorcycle Club members pointing guns at his head, prosecutors say. Jenkins pleaded for his life. "He kept saying, 'Call Pirk, call Pirk, call Pirk," Assistant U.S. Attorney Joseph M. Tripi said during a court appearance last week. The call was made, Tripi said, and Kingsmen President David Pirk, the man accused of orchestrating the double murder in North Tonawanda, ordered the Tennessee chapter members to back off. "Pirk gave the stand-down word, and they let Jenkins go," Tripi told U.S. Magistrate Judge Michael J. Roemer. Pirk's intervention on behalf of the man who eventually went to prison for killing Daniel “DJ” Szymanski and Paul Maue is proof that he planned and directed the murders, prosecutors allege. Jenkins, who is also charged in the federal case, is serving life without parole. The story of Jenkins' confrontation in Tennessee, revealed during a recent court appearance, is the latest development in a federal prosecution that cast a spotlight on the local and national biker scene. At the core of the case is the allegation that the Kingsmen went from a small motorcycle club, founded in Lockport 60 years ago, to a violent outlaw gang. Prosecutors say Pirk was the driving force, not only behind the murders, but behind the club's transition to a “one-percenters” club. With Pirk's trial only six weeks away, it's clear the government's chief target is the 66-year-old North Tonawanda native with the distinctive long white hair and beard. Obviously, his defense doesn't buy the federal prosecutors' theory. "The government argues that because he ordered the Tennessee chapter to stand down, he's guilty of a crime," said William T. Easton, one of Pirk's defense lawyers. "It seems they got it backward." Two years in the making, the trial before U.S. District Judge Elizabeth A. Wolford is the culmination of a case that rocked the local biker community. Pirk, a Florida resident, and 15 other Kingsmen were charged in the original grand jury indictment. Five of those defendants took plea deals, and some may testify against Pirk and the other Kingsmen on trial. From the start, there were questions as to whether any Kingsmen would turn against the club, but the defendants who took plea deals acknowledged the club was a criminal organization that sold drugs and guns, and followed a strict chain of command with Pirk at the top of the hierarchy. The two killings stemmed from a split in the Kingsmen between club members in Western New York who didn’t want to be one-percenters and the guys in Florida who did, according to the FBI. 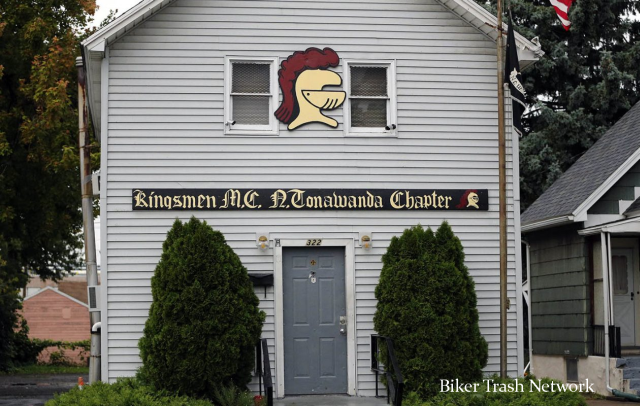 Investigators say the murders were also a warning to Kingsmen thinking of leaving the gang for a rival club, the Niagara County-based Nickel City Nomads. At every step in the prosecution, Pirk's lawyers — Easton and Cheryl Meyers Buth — have argued that he had nothing to do with the murders. He also pleaded not guilty to the other charges against him. In custody since his arrest in March of last year, Pirk continues to be the subject of widespread media attention, and often the news accounts of his criminal prosecution come with a copy of his mug shot. Easton and Meyers Buth have pointed to the pre-trial publicity in an effort to move Pirk's trial to Rochester. Prosecutors, meanwhile, continue to argue that Pirk was instrumental in planning and carrying out the killings, and that Jenkins acted on his orders. It was during a bail hearing early last week that prosecutor Tripi revealed the story about Jenkins' near-fatal confrontation in Tennessee and Pirk's alleged role in protecting him. "It sounds a little too dramatic," said Michael S. Deal, one of Jenkins' lawyers, of the plastic on the floor and drawn guns. "But regardless, it doesn't implicate my client in any way." Tripi said the Tennessee chapter knew Jenkins had been in Buffalo but didn't know about Pirk's involvement in the murders. He also said Jimmy Ray Fritts, the Kingsmen who was seeking bail last week, was one of the Kingmen pointing a gun at Jenkins' head that day in 2014. "They put him in a clubhouse, put a gun to his head and said they were going to kill him," Tripi said of Jenkins. At that point, according to the government, Jenkins pleaded with his fellow Kingsmen to call Pirk, and that's when Pirk gave the order to stand down. Tripi said phone records will verify the calls and that a government witness is prepared to testify about what happened inside the Tennessee clubhouse that day. Fritts' defense lawyer says the 67-year-old Kingsmen knew nothing about the murders and is not implicated in any of the other violent acts outlined in the indictment. "Mr. Fritts, who admits he was part of this organization, is being held accountable for the conduct of other people," said defense attorney Daniel M. Griebel. Fritts was ordered released but restricted to home detention with an ankle bracelet. With roots dating back to the 1950s, the Kingsmen grew over the years and, until recently, operated a dozen clubhouses throughout the region, including rural areas such as Attica, Arcade and Gowanda. They also have a presence in Florida, Tennessee and Pennsylvania. Prosecutors say the clubhouses served as a venue for membership gatherings, also known as "church" meetings, but also doubled as a place to store drugs and weapons. They're just scared to be your enemy"
San Francisco, California (November 20, 2017) —Biker Trash Network— Federal prosecutors in San Francisco have charged nine members of the Hells Angels Motorcycle Club with running a criminal organization responsible for multiple robberies and assaults and one murder. The U.S. Attorney's office and FBI announced the charges on Monday. Most of the defendants are members of the group's Sonoma County chapter in Northern California. 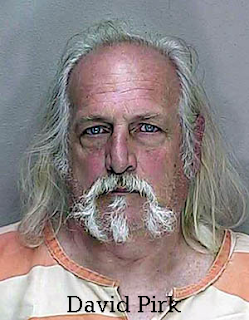 The most serious crime, however, took place when Jonathan “Jon Jon” Nelson, the president of the Sonoma County chapter of the Hells Angels, told an unnamed victim to meet with Brian Wendt, the president of the Fresno County chapter of the Hells Angels—with Wendt then murdering the victim, the indictment states. Other crimes laid against the gang members include drug trafficking, assault, robbery, illegal guns and witness intimidation. “This week we have taken a significant step toward bringing to justice an alleged conspiracy whose aim has been to commit violent crimes,” U.S. Attorney Brian Stretch, of the Northern District of California, said in a statement Monday confirmed by BTN. Another Hells Angels member sexually assaulted someone identified only as “Victim 6” last year, threatening during the attack to hurt Victim 6’s family if they reported the assault. The head of the FBI's San Francisco division, Jack Bennett, said their crimes were intended to instill fear in parts of the city of Santa Rosa. The indictment also includes multiple charges of intimidating witnesses. 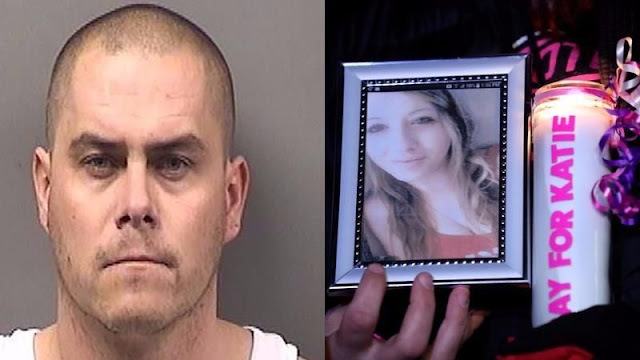 JOLIET, IL (November 18, 2017) — Jeremy Boshears, of Coal City, was charged with killing Kaitlyn Kearns by Will County authorities on Saturday. According to a release from Will County State's Attorney James Glasgow's office, the 32-year-old Boshears was charged with three counts of first-degree murder. The three counts allege that Boshears shot Kearns, of Mokena, in the head with a firearm on Nov. 13. Will County Circuit Judge Carla Alessio Policandriotes reviewed the murder case and signed an arrest warrant that included a $10 million bond. A court date has yet to be scheduled. Boshears was booked into the Jerome Combs Detention Center in Kankakee on Friday after he was charged with concealment of a homicide by Kankakee County State's Attorney Jim Rowe. Kankakee County Judge Kathy Bradshaw-Elliott set Boshears' bond on that charge at $250,000. It is alleged Boshears drove Kearns' 1996 Jeep Grand Cherokee with her body inside to a residence in Aroma Township and parked it in a pole barn. On Thursday, investigators using electronic means were able to locate the vehicle. They found her in the back of the vehicle. She was pronounced dead of a single gunshot wound to the head. Investigators do not believe the property owner was involved or had knowledge of the murder. Rowe has agreed it is appropriate to prosecute all charges in Will County. He has agreed to dismiss his charge so that a similar charge can be filed in Will County as part of the overall prosecution of this case, according to the release. According to the Will County sheriff's release, investigators believe Kearns had met Boshears four weeks ago while she worked as a bartender at Woody's bar, located in the 1000 block of East Washington Street in Joliet. Kearns dated Boshears for the past two weeks. Kearns told people she was going to the Outlaws Motorcycle Clubhouse after she got off her shift at 1:30 a.m. on Monday. The clubhouse is down the street from Woody's. Kearns was reported missing at about 2:45 p.m. Tuesday by her father. On Wednesday, Joliet detectives turned the search over to the Will County Sheriff's Department. Will County investigators searched the Outlaws' building Thursday. A media report said investigators towed Boshears' Dodge Charger from an alley next to the clubhouse. In obtaining the warrant, a prosecutor said in Kankakee County court that Boshears is a known member of the Outlaws. On Friday, Will County Sheriff's Public Information Officer Kathy Hoffmeyer said they had a person of interest (Boshears) in custody in the investigation of the murder. "The person in custody has retained an attorney, and we are unable to speak with him any further," she said. 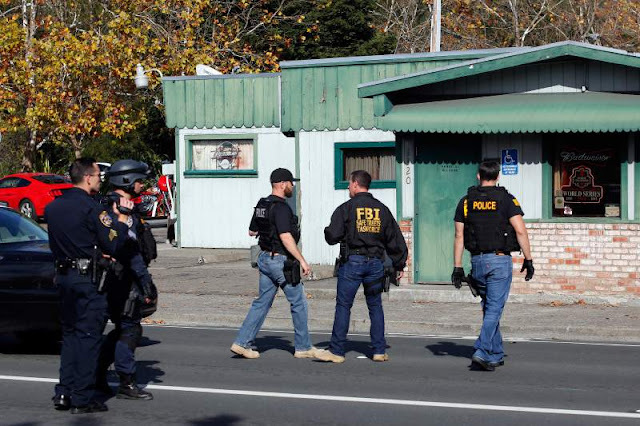 Santa Rosa, California (November 18, 2017) —Biker Trash Network— Law enforcement officers led by the FBI surrounded a Santa Rosa bar where motorcyclists affiliated with the Hells Angels motorcycle club had gathered on Saturday afternoon, part of an extensive, daytime police action that also focused on a home in southwest Santa Rosa and resulted in arrests, authorities said. An FBI spokesman said the operation was conducted under a sealed federal warrant, but neither he nor local law enforcement officials would say who the operation was targeting or how many locations were involved. 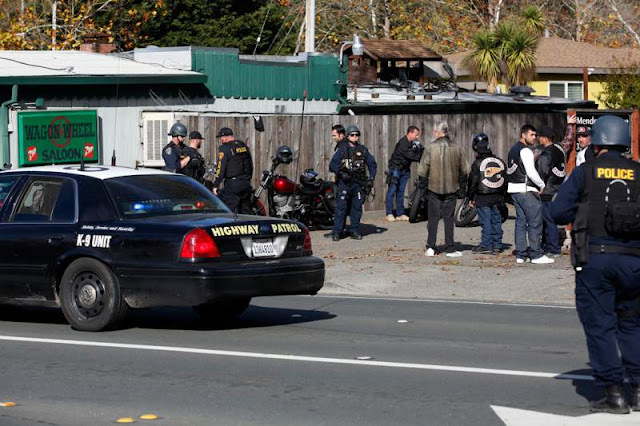 However, witnesses at the Wagon Wheel Saloon around noon said they saw motorcycles being seized and riders detained outside the bar on Mendocino Avenue. 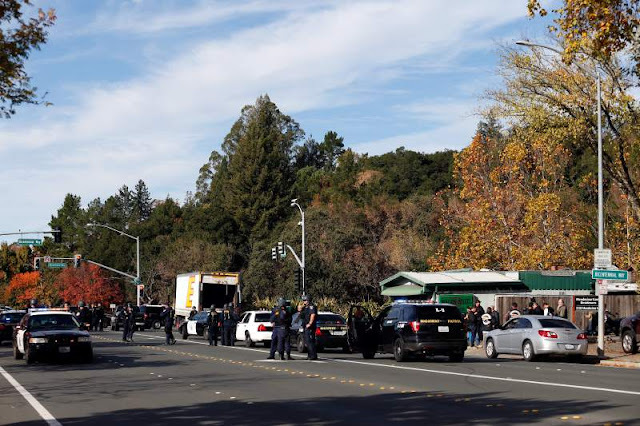 A tactical team from the FBI was on site, as were a number of CHP officers and the armored SWAT vehicle shared by the Santa Rosa Police Department and the Sonoma County Sheriff’s Office. Some of the heavily armed officers wore full tactical gear, including Kevlar helmets and bulletproof vests, and wielded assault rifles. No shots were fired or physical altercations reported. Santa Rosa Police Chief Hank Schreeder said there was a “significant” number of Santa Rosa officers and detectives who assisted the FBI in the operation, which later also involved an armed search of an Antelope Lane home, 6 miles to the south in the city’s Bellevue Avenue neighborhood. Prentice Danner, the FBI spokesman, confirmed that arrests were made but declined to say how many. The federal warrant will be unsealed Monday, he said, when the agency plans to share more information at a San Francisco press conference. 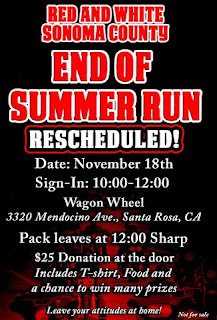 The Wagon Wheel Saloon was the scheduled departure point Saturday for a Hells Angels Motorcycle Club ride billed as the “Red White Sonoma County End of Summer Run,” according to the website of the group’s Sonoma County chapter. The previously planned ride had been rescheduled due to last month’s fires. One rider said he traveled Saturday from Fort Bragg with a group of about 10 fellow motorcyclists for the scheduled ride. As riders were outside the bar “starting up their bikes” and getting ready to head out, he said, a swarm of law enforcement appeared. “They just surrounded the place and wouldn’t let anybody go anywhere,” said the rider, Dan, who would only give his first name. Officers eventually allowed some riders, including him, to leave. Though he was separated from the rest of his group, he said. Multiple riders in front of the bar Saturday were seen wearing vests with Hells Angels’ patches on them. 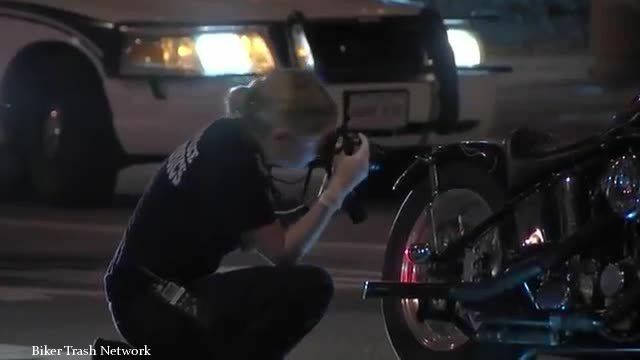 Authorities would not elaborate on what ties, if any, the club or motorcycle riders in general had with the police action. A Wagon Wheel bartender who refused to provide his name indicated that the establishment appeared not to be the target but a staging ground for the police raid. About 12:30 p.m., Santa Rosa police issued a public notice advising people to avoid the Mendocino Avenue block where the Wagon Wheel is located, between Administration Drive and Bicentennial Way. The block was reopened by 2 p.m. and law enforcement left. A handful of bikers in leather Hells Angels vests lingered outside of the bar but refused to comment. Others drove off on their Harley-Davidson's toward Highway 101. 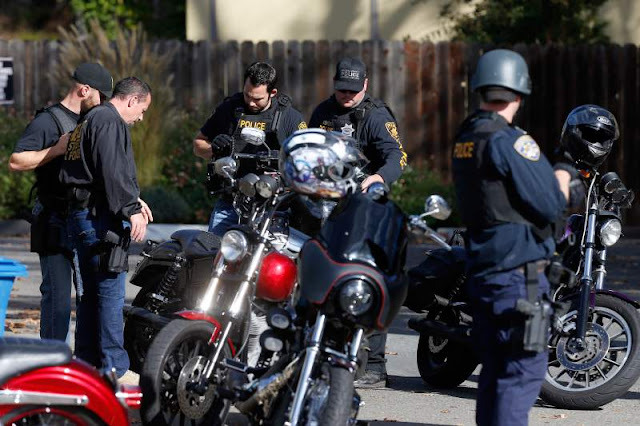 Groups of motorcycles, including Hells Angels riders, were later reported as they were seen by officers traveling in the area and across Sonoma County, according to radio dispatch traffic. 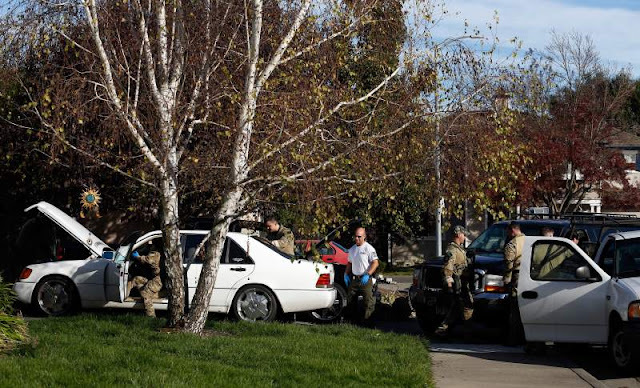 After 2 p.m., FBI officials were seen surrounding the home off Antelope Lane, where they reportedly used concussion grenades in a search that the FBI spokesman confirmed was related to the raid at the saloon. Roughly a dozen FBI agents were staged outside the home about 3 p.m. They wore camouflage uniforms and bulletproof vests and carried assault rifles. A Santa Rosa Police detective assisting at the scene described the search as connected with an FBI case. FBI agents on the scene refused to comment. As the search was underway, a man who said he lived at the residence sat outside on a fire hydrant. The man, who refused to share his name, had not been detained. An owner of the Wagon Wheel could not be reached late Saturday. 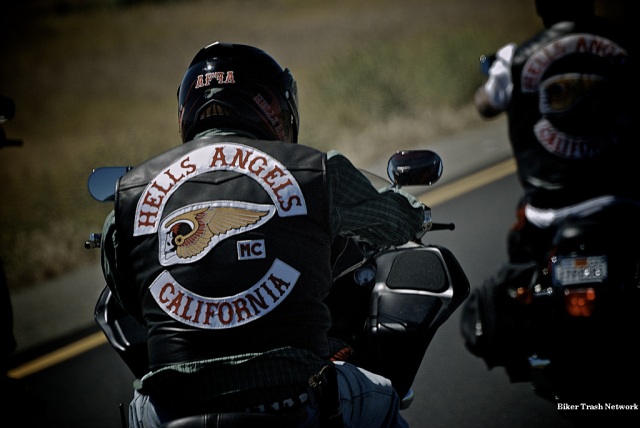 A representative of the Sonoma County Hells Angels did not return a phone call seeking comment. 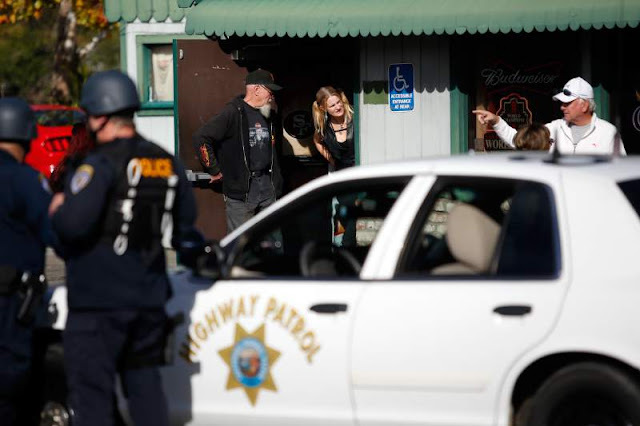 At the Wagon Wheel on Saturday afternoon, a man who declined to provide his name for fear of his safety, said he pulled over near the bar about 1 p.m. and saw in the area at least two dozen law enforcement officials, including CHP and FBI representatives as well as police dogs. He said he saw authorities confiscate Harley-Davidson motorcycles and load them into a truck. 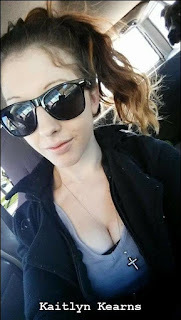 Joliet, Illinois (November 16, 2017) — The Will County Sheriff's Department confirmed late Thursday afternoon that investigators do have a person of interest in the murder of 24-year-old Joliet bartender Katie Kearns, of rural Mokena. She suffered a single gunshot to her head, authorities revealed. 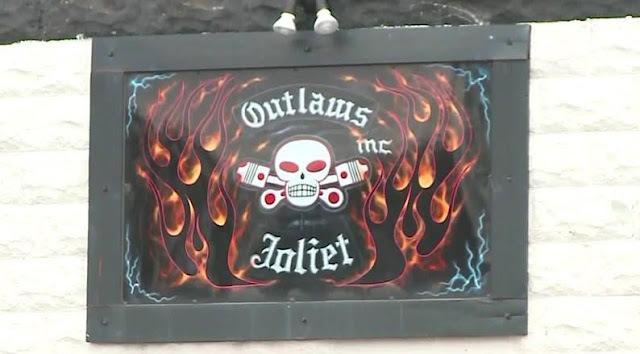 The Outlaws MC's clubhouse in Joliet, Ill. The sheriff's department also confirmed there is an apparent connection with the young woman's disappearance and the Joliet Outlaws Motorcycle Club. "We are confirming that she had told four different people that she was heading to the Outlaws Clubhouse after her shift," Will County Sheriff's Department Spokeswoman Kathy Hoffmeyer said. Kearns was found murdered inside of the 1996 Jeep Grand Cherokee that she was driving. Her vehicle was located in a rural area of Kankakee County near St. Anne's, which is southeast of Kankakee, about an hour's drive from Woody's or the Joliet Outlaws Clubhouse. "It's out in the country," Hoffmeyer said of the crime scene. By 10 a.m., the Will County Sheriff's Department SWAT team showed up in force at the Joliet Outlaws clubhouse and stormed into the place. "'They might have taken a car out of there as part of the investigation," she said. At this stage, it appears that the homicide investigation is coming together. "We do have a person of interest," Hoffmeyer said. "No charges have been filed yet." She said that Will County Sheriff's investigators have been working nonstop on the investigation since Wednesday morning. "Several of them have not gone home since Wednesday morning." Hoffmeyer confirmed that, around 10 a.m., several hours after Kearns was found dead about an hour southeast of Joliet, the Will County Sheriff's Police raided the Joliet Outlaws Motorcycle Club. The clubhouse is up the road from Woody's, also along East Washington Street. Some Outlaws frequent Woody's Bar, where Kearns was last seen alive. In its press release about the homicide, the sheriff's department emphasized that "detectives believe that there is no threat to the community and that (Katie) was the intended target of this homicide." Thursday's late morning announcement by Will County comes on the heels of a volunteer search effort that was apparently underway around the east side of Joliet in hopes of finding Kearns and the missing Jeep.